The short-haired bumblebee (Bombus subterraneus) is the rarest of four bumblebees introduced to New Zealand from the United Kingdom in the nineteenth century for pollinating clover and other important crops. Recently the same species has gone extinct in the UK, the last recording of it there being in 1988. 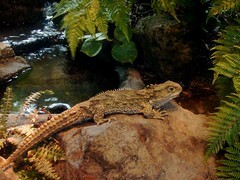 Not surprisingly, the New Zealand population has been proposed as a source for re-introduction of this species to the UK. However, very little is known about the biology of this species and research is hampered by the difficulty of exact identification as it co-occurs with two morphologically similar species (B. hortorum and B. ruderatus). Dr Roddy Hale at Lincoln University and Dr Marie Hale at the University of Canterbury developed an undergraduate summer scholarship program to developed simple PCR-based molecular identification tools for these species. In a recently published paper in Conservation Genetics the student Lucy Stewart was able to rapidly, cheaply, and reliably identify not only B. subterraneus, but also the two other similar-looking species. We combined a species-specific internal primer with two non-specific external primers that amplify 426 bp of the Bombus Cytochrome b gene, to produce a presence/absence PCR test that is combined with a positive internal control. The result is a set of molecular tools that will allow us to separate three cryptic species and facilitate basic research on the biology of New Zealand’s rarest bumblebee. In the face of degradation of the environment and loss of species biodiversity, there is a call for innovative bio-indicators. New Zealand native spiders have answered it with their usefulness for measuring an ecosystem’s “health.” They can be used to monitor ecological restoration of natural and agricultural systems and monitor land and air pollution from industrial processes. The tricky part is how to measure and monitor the biodiversity of spider species and their relative abundance at a given location. Several sampling methods are available for this kind of work but they will all give different results. Perhaps the easiest way of going about it is to use insecticide gas or ‘chemical fogging’ to cause any invertebrates in the area to drop dead to the ground and then be picked up for later examination. Another similar method is to use pitfall traps filled with a substance such as ethanol in which any invertebrate walking along can stumble into. These methods are very effective in the amount of spiders captured for examination but if you are investigating endangered species with conservation significance, it can prove counter-productive. 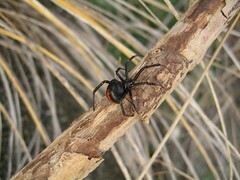 The endangered species may not be spiders either as these sampling methods are non-discriminate to non-target species. Non-lethal sampling techniques can be employed such as timed hand searches or basically shaking foliage until spiders fall off. These techniques have the advantage of being selective for which species, if any, are killed for further examination. A new non-lethal approach was described by Simon Hodge (Imperial College, London), Cor Vink (AgResearch, Lincoln), Jonathan Banks (Waikato University), and Mike Bowie (Lincoln University), published in a 2007 issue of the Journal of Arachnology. They looked at the use of a new non-lethal sampling technique with artificial homes being placed out in the field for spiders to take shelter in. The inspiration for this idea came from previous researchers using the same technique to measure tree weta communities. Often these researchers would open up their weta shelters only to find native spiders hiding away instead. The shelters built for the spiders consisted of a block of wood with a central groove cut two thirds of the way down, a transparent plastic cover attached over the groove as a window and black polythene stapled over the window to block out light. All the researchers have to do is peal back the black cover to observe any spiders present. Simon Hodge and colleagues found that within a year, 91% of their shelters placed in the field were occupied by spiders. Environmental factors such as soil moisture, light intensity on the shelter and ground slope were measured to see if they impacted occupancy frequencies but they proved inconclusive. The species of tree that the shelters were placed on and the height on the tree did not have an impact of occupancy rates either. The results of this research show the effectiveness of these shelters at harbouring spiders but as a surveying technique, the abundance and diversity of spiders measured is low compared to the current conventional sampling methods I mentioned earlier. The shelters also don’t cater for all species of spiders as only those that are tree dwelling are likely to adopt them as their new home. Overall this sampling method can be employed not only as bio-indicator of the environment and biodiversity but as a tool for measuring spider communities within a habitat. To be effective in the field, this sampling technique would need to be accompanied by another sampling technique to bolster the amount of individuals and species of spiders found. This blog post was written by postgraduate student Karel Lindsay as part of the course, Research Methods in Ecology (Ecol608). Blue penguin population decline on the West Coast: is it caused by low breeding success? Editor's note: this is an additional summary and commentary on the West Coast blue penguin story that was reported on last week by Wawrick Allen. Even though blue penguins (Eudyptula minor) are still relatively common on New Zealand’s offshore islands, surveys by the West Coast Blue Penguin Trust indicate that there are only a few hundred left on the West Coast of the South Island mainland. But what is making one of the cutest and most beautiful birds of New Zealand decline in abundance? Is the blue penguin another victim of New Zealand’s numerous introduced predator species? Do possums (Trichosurus vulpecula) and stoats (Mustela erminea) account for this huge decline in the last 30 years by feeding on little blue penguin eggs and chicks? Or is the decline due to road kills caused by a bigger exotic species called Homo sapiens that runs them over with their speedy cars? Apart from these reasons, the blue penguins might also have problems with the difficult tasks of finding a good nesting site, laying one or two eggs, keeping them warm until the chicks hatch, and rearing them until they are prepared for the big, wide world. Before the research described in this blog, not enough was known about the breeding biology of the West Coast's blue penguins to determine whether environmental or biological factors were the most important reasons contributing to the population decline. Masters student Sol Heber, under the supervision of ornithologist Kerry-Jane Wilson and behavioural ecologist Laura Molles at Lincoln University, examined the breeding biology and breeding success of the West Coast penguin population. This work was published in a 2008 issue of the New Zealand Journal of Zoology. 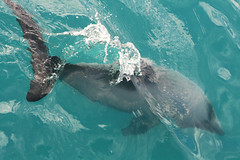 Nine study sites distributed along the West Coast were observed during breeding season from August to December 2007. These study sites were checked several times a week for eggs, hatched or fledged chicks as well as potential predators. The hatching, fledging and breeding success rates were rather high: 78.9% of the eggs that were laid hatched, 83.9% of the hatched chicks fledged and the overall breeding success, meaning chicks that fledged out of the laid eggs, was 66.2%. These results are better than expected, showing that the blue penguins are doing well in breeding and that reasons other than low breeding success must be the main cause for the declining populations (unless 2007 was an exceptional year, which is unlikely). Some of these reasons have been described in this article and should be further investigated as soon as possible in order stop the alarming decline of blue penguin populations. Penguin chick preyed on by a stoat. In just the five month time period of this study, 15 road kills of little blue penguins were observed. This number doesn’t even include how many roadkills are not counted and how many happen at other study sites or over the duration of a whole year. As blue penguins are busy breeders and rear up to two chicks a year with both parents required to rear them, one adult road kill can account for the removal of up to three individuals from the population. Even though only 10.7% of chicks were taken by predators, this hazard should also not be taken lightly. Other factors that may affect the West Coast blue penguin population are all human caused problems such as predation by dogs and habitat loss caused by erosion, subdivision and development of housing allotments. Furthermore, drowning in fish nets (by-catch) might constitute a sea mortality factor. More research is urgently needed to quantify adult mortality caused by all these factors, in particular road kill. Hazardous road crossing points regularly used by blue penguins should also be identified and modified. This blog post was written by postgraduate student Sara Bauer as part of the course, Research Methods in Ecology (Ecol608). Although New Zealand has a huge selection of seabirds, and is the centre of diversity for many groups, we are still in a very early stage in understanding the behaviour and ecology of these species (see the recent ecoLincNZ blog post by Jessica Parisi). Mostly this is understandable. Seabirds usually live on remote oceanic islands that are difficult to get to and even more difficult to stay on for any length of time. More importantly seabirds spend most of their time at, well, sea. What they get up to hundreds of kilometers from land is difficult to study. Luckily, technology is providing solutions. Tina Troup, as part of a Master of Science, was interested in the foraging of royal albatoss (Diomedea epomophora) during their breeding season. Where did the go? What did they do? Using satellite transmitters to track position, dry-wet recorders to identify when birds were on the water and heart-rate monitors to examine how much work the birds were doing, Tina trooped off to Campbell Island in the New Zealand sub-Antarctic zone. Ten southern royal albatross were tracked through incubation (January/February). In a recent paper published in New Zealand Natural Sciences (34: 19-28) Tina, along with Adrian Paterson and Craig Sixtus from Lincoln University, report on their findings. Royal albatross appear to have specific foraging grounds that are hundreds to thousands of kilometers from Campbell Island. This causes them fly in what we term a 'commute, forage, commute' foraging strategy. The birds would generally commute in a direct movement, covering up to 800km/day. Foraging was more haphazard and the birds covered less than 180km/day, making frequent changes in direction and landing often. Once birds were satisfied with an area they would then commute to the next area to forage. Wind direction and strength were shown to be important in determining how quickly the albatrosses could move and in the directions that they tended to move in. Winds from head, tail and right angles made it difficult to return to the colony. Likewise, bird mass was also important with lighter birds under 9kg finding it difficult to land in winds over 40km/hr. Overall, there appeared to reasonable flexibility in starting each foraging trip with birds able to select different foraging sites depending on the direction and intensity of the winds around Campbell Island. Obviously, only being able to follow ten birds for a month limits what we can discover about the biology of the royal albatross. However, a small window has opened onto a part of their lives that we know little about. Well the meeting is done. The talk is given. The t-shirt is purchased. I'm mooching about Moscow, Idaho ahead of my long flight back to New Zealand tomorrow. 1200 evolutionary biologists, mainly from the States, gathered here at the University of Idaho over the last week to discuss all things evolutionary. Moscow is a small town with a big university and the hospitality was, as they say, a credit to the region. New Zealanders had a large presence here this year. Dave Penny (Massey University) gave the past president's address for the Society of Systematic Biologists and encouraged us all to continually question ourselves and our science. There were numerous Kiwis either escaping winter or currently doing PhDs and postdocs overseas. In my session there were three of us speaking. The best thing about our session, entitled Phylogeography, apart from the awesome talks obviously, was that it was in a law school lecture room that had been built to resemble a court room. Evolution on trial indeed! After some of the cross examinations that I have been receiving lately about drowning New Zealand in the Oligocene I felt quite at home. Of course we all made the most of it with bad jokes. Thomas Buckley (Landcare Research) talked on the relationships of the stick insects, especially focussing on the very endangered tree lobsters of Lord Howe island. Martyn Kennedy (University of Otago) talked about the various paua snails in the North Island and how they have lost most of their shells over the last million or so years. I talked about the Chatham Islands, mainly focussing on the endemic flora and who they are related to and how long they have been there (New Zealand mainland and not long). Other New Zealanders talked on various NZ plant groups, population genetics, phylogenetic analysis methodologies, selection on fish genes and sexual selection. There were lots of good talks and a major theme of the conference seemed to focus around rates of diversification of species. A great conference with lots of interesting discussions. Coupled with the summer sun and some excellent microbrewery beers, I feel revived and ready to plunge into some research. 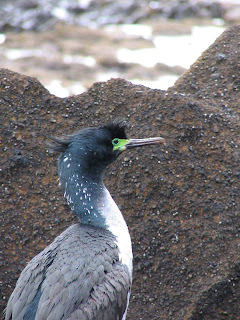 There are over 80 breeding species of seabirds in the New Zealand region and one of them, the Pitt island shag (left), is also endangered. 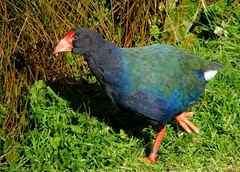 Nearly half are endemic, meaning they are found only in New Zealand. A special report on the current state of New Zealand’s seabirds was created in 2006 by seabird expert Kerry-Jayne Wilson (Lincoln University) for the Ornithological Society of New Zealand. The results are, unfortunately, quite grim. What’s even more disappointing is the lack of funding, support and research of these seabirds. I was quite astonished after reading this report as to how little is known of their status. The main groups of birds the report refers to are as follows: albatrosses, petrels, penguins, shags, gannets and boobies, gulls, skuas and terns and Kermadec Island seabirds. Among New Zealand’s seabirds in decline are many poorly-known New Zealand endemics. While an increasing population trend of the Australasian gannet proves hopeful, more information on the breeding biology and population trends of the masked booby is needed. Of the three species of gulls found in New Zealand, the black-billed gull is the one that is endemic, endangered and declining. Related to the gulls is the skua, also refered to by Kerry-Jayne as an aggressive predator, is now subject to intensive study by an Auckland University student. “Of the 5 species of breeding terns, 3 are endemic. The New Zealand fairy tern is the country’s most critically endangered seabird with only 10 breeding pairs in Northland.” Finally, the Kermadec Islands provide the only place in New Zealand where a number of tropical and sub-tropical seabirds breed. Some key findings of this report were that “fisheries by-catch is a serious threat to albatrosses and some petrels and recreational set-net fishing poses an unquantifiable threat to penguins, shearwaters and shags.” Since this practice clearly affects many of New Zealand’s seabirds, it is my suggestion that alternative environmental and cost friendly fishing practices be proposed. As Kerry-Jayne Wilson says,“The conservation needs of most seabirds are not being met and unfortunately, much of the research on seabirds is driven by pressure from external agencies, rather than the needs of endangered species." Overall, there are a number of organizations and volunteers concerned with the future of New Zealand’s seabirds looking to make a difference. With the appropriate funding, they would be able to. As for interested students, simply apply. This blog post was written by postgraduate student Jessica Parisi as part of the course, Research Methods in Ecology (Ecol608). Out of the 7–20 million species believed to be on the planet, a loss ranging between 140,000– 5 million is projected over the next 25 years. Efforts to avert this situation are present but the challenge has been on how to evaluate the effectiveness of these programmes. As a result, a decision on whether to continue funding a programme or not is difficult. For example, it is not easy to justify why one programme should be given preference over the other if their outputs cannot easily be compared. Ross Cullen, Geoffrey Fairburn and Ken Hughey of Lincoln University have found a solution in their study “Measuring the productivity of threatened – species programmes,” published in a 2001 issue of the journal, Ecological Economics. In this study, an output measure, Conservation Output Protection Year (COPY), and Cost–Utility Analysis (CUA) method was used to evaluate New Zealand threatened species programmes. In New Zealand, there are 1000 threatened species out of which 31 have species recovery plans (DOC/MFE, 2000 and DOC, 1999). These recovery plans are normally directed toward controlling predators, especially the introduced ones such as possums (Trichosurus vulpecula) or competitor numbers. The species statuses are described by their position on a ranking system. An example of a widely known ranking system is the IUCN Red List criteria, which places species in one of the 11 categories including; Extinct, Critically Endangered, Endangered, Vulnerable, and Lower risk (IUCN, 1994). CUA was first developed to evaluate health–care programmes. It measures the output of a programme by way of utility or worth of a health status. The argument was, if the outcomes of health could be measured in units called ‘Quality Adjusted–Life-Years’ (QALY), it was possible to compare different medical interventions. Comparisons could be made if the direct costs of each type of intervention were divided by the QALY they gained (Drummond et al., 1997). Cullen et al. (1999) and Stephens and Lawless (1998) applied CUA to conservation and implicitly used the term ‘utility’ to refer to the change that occurs in an ecosystem. Cullen et al. (1999) developed the COPY as means for evaluating the output gained from various species conservation projects. COPY serves same functions as QALY does in health care evaluation because it allows effectiveness of unlike activities to be compared. Twenty two threatened–species recovery programmes were sampled but from five, response was not obtained thus 17 were evaluated. A categorization system was developed which is closely related to the IUCN Red List although with seven categories. This was used to evaluate the conservation statuses of the species. Data for estimating COPY gained by each programme was provided by the conservation group leaders. They rated the species status with and without management for each year the recovery plan was in effect. Using two equations, the conservation pay–off and cost per copy for each programme were calculated. Nine species recovery programmes produced zero COPY or no conservation output. One of the possible explanations to this is that threatened species take a long time to respond to conservation efforts. Eight species indicated improvement in their conservation status: Black stilt, Yellow–eyed penguin, short–tailed bat, Takahe, Hector’s dolphin, Campbell Island teal, Brothers Island tuatara and Cook Strait tuatara. Estimating the cost of programmes and projects posed a challenge. Of interest were direct operational costs, organizational overhead component, staff salaries and the capital charge. However, the study indicated that the CUA can provide valuable information on the productivity of threatened-species recovery programmes. Cullen et al., 1999. Copy: a new technique for evaluation of biodiversity protection projects. Pacific Conserv. Biol. 5 (1999), pp. 115–123. Drummond et al., 1997. Methods for the Economic Evaluation of Health Care Programs (second ed. ),, Oxford University Press, Oxford. DOC, 1999 Department of Conservation Annual Report for the Year Ended 1999, Department of Conservation, Wellington. DOC/MFE, 2000. New Zealand's Biodiversity Strategy, Wellington. Available at http://www.biodiv.govt.nz/. Stephens and Lawless, 1998 Cost–Utility Evaluation of Natural Heritage Biodiversity Conservation Projects, Department of Conservation, Wellington. This blog post was written by postgraduate student Benard Ochieng as part of the course, Research Methods in Ecology (Ecol608). Omnivorous insects are interesting and important beings, consuming both plant and animal matter. In agroecosystems they have been identified as potential biological control agents since they eat pest insects. 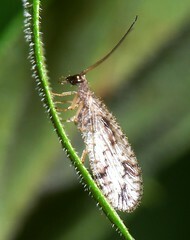 Micromus tasmaniae, the brown lacewing, was the subject of a recent study, by Katherine Robinson and colleagues at Lincoln University (see the journal Basic and Applied Ecology, 9:172–181 (2008)). The brown lacewing is both a predator of many small insects and it feeds on nectar and pollen from flowers, making it omnivorous. Katherine and her colleagues attempted to understand the relationship between this predator and its prey and the effects of other food resources on the dynamics of this relationship within agroecosystems. The authors report that it’s unclear how much predation actually affects plant- feeding pest species. However it has been reported that predators like the lacewing have been responsible for decreases in economic damage to crops by reducing herbivorous pest species. Prey provides nutrients necessary for survival, development and reproduction. In biological control complementary resources are necessary for the predator to complete its lifecycle. Many omnivorous predatory species in agroecosystems rely on floral resources to provide nectar and pollen at the adult stage of their lifecycle. Despite a number of studies, the omnivore’s potential role in biological control has included little research into how plant resources affect pest suppression. This includes attributes such as longevity and fecundity, which act over a longer term to affect predation at the population level. The main thrust of this study was to examine the presence of floral resources and how they influence the predatory role of the omnivorous insect, the adult lacewing. Katherine and her colleagues ran a number of experiments to determine whether floral resources affected omnivore predation dynamics. The first experiment established whether or not lacewings consumed plant matter as well as prey. This included the floral resource buckwheat Fagopyrum esculentum, which has a sucrose-rich nectar. The pea aphid Acyrthosiphon pisum was the prey subject. Lacewings were allocated to two treatments for 24 hours, those with flowers and those without, both containing aphids. The first treatment contained lacewings placed in an enclosure where one contained a water-filled vial containing buckwheat flowers, and the second treatment was an enclosure consisting of water only in the vial. After dissection, lacewings were examined using a reagent to determine the consumption of pollen or nectar. Their second experiment noted the effect of flowers on lacewing longevity in the absence of prey. Again subjects were allocated to two treatments, one without buckwheat and one with. Survival of lacewings was recorded until death. Experiment three looked at effects of flowers on lacewing fecundity. Here the lacewings were allocated to six treatments, unpaired males with flowers, unpaired males without flowers, unpaired females with flowers, unpaired females without flowers, pairs with flowers and without flowers. Thirty aphids were added to the enclosures, surviving aphids were counted for 10 days from the unpaired treatments, and for 15 days from the paired lacewing treatments. Their last experiment demonstrated the effect of flowers on lacewing survival and fecundity with or without prey. Lacewings were allocated to four treatments, flowers and aphids, with flowers and without aphids, without flowers, with aphids, without flowers or aphids. Survival and number of lacewing eggs were counted for 20 days. The results of this study highlighted that the presence of buckwheat flowers actually reduced consumption of aphids. However without prey availability, longevity for lacewings was greater when supplemented with flowers. Where there was an abundant supply of aphids, lacewing fecundity was not affected by flowers. When there were fewer aphids, the provision of buckwheat flowers meant that lacewings laid eggs earlier and more eggs were laid each day. This study has demonstrated that floral resources may play a role in mediation in omnivore and prey relationships, and with regard to biological control, flowers may have both positive and negative effects. This blog post was written by postgraduate student Marlene Leggett as part of the course, Research Methods in Ecology (Ecol608). Is Rangatira Island’s status as a wildlife sanctuary threatened by burrowing seabirds? 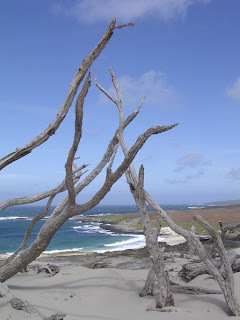 Rangatira Island, part of the Chatham Islands group situated off the east coast of New Zealand, is a conservation priority in New Zealand due to its importance as a seabird breeding colony and a haven for threatened species. This includes birds endemic to the Chatham Islands and most importantly, the largest of two populations in the world of the critically endangered black robin (Petroica traversii). Black robins are especially vulnerable due to their tiny population size of only around 200 individuals. Vegetation is vitally important for Rangatira Island to maintain its status as a wildlife sanctuary. It provides protection against the bitter and frequent winds blowing northwards from the Antarctic, locally known as the ‘roaring forties’. The island has a population of around 3 million burrowing seabirds, which equates to 14,000 birds per hectare. At this density, birds have the potential to greatly affect the terrestrial ecosystem through sea to land nutrient transfer in the form of bird poo. Vegetation regeneration is also disrupted by bird trampling and mechanical disturbance from the digging of nesting burrows. Rangatira Island forest understorey (Photo: C. M. Roberts). A similar situation has occurred on Grassholm Island, off the coast of Wales. Grassholm Island supported half a million puffins (Fratercula arctica) in 1890, but trampling and burrowing by birds led to almost complete vegetation loss and extensive erosion. Eventually the island could no longer support a large seabird population. The paper 'Burrowing seabirds affect forest regeneration, Rangatira Island, Chatham Islands, New Zealand' by Cynthia Roberts, Richard Duncan and Kerry-Jayne Wilson aims to understand the relationship between burrowing seabirds and vegetation so that Rangatira may avoid the fate suffered by Grassholm Island. It was published in a 2007 issue of the New Zealand Journal of Ecology. Clearing of vegetation for sheep and cattle farming started in the early 1940's and anthropogenic affects on the Island's vegetation continued until the removal of the remaining stock in 1959. The clearing of vegetation and undergrowth on the southern side of the island has resulted in the death of forest margins from salt and wind exposure. This barren and exposed area is called ‘the clears’ and is void of bird habitat and forest cannot recolonise the salty eroded soil. ‘The Clears’ as seen from the summit of Rangatira in January 2003 (Photo: B.Bell). Despite the potential for seabirds to cause a problem, prior to this study little was known about forest dynamics on Rangatira Island and the effect of burrowing seabirds. The observational field study carried out by Roberts, Duncan and Wilson investigated the dynamics of the relationship between burrowing seabirds and vegetation on Rangatira Island. 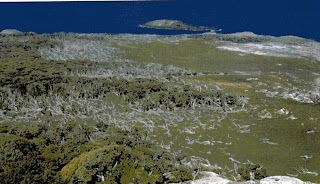 The forest was found to be dominated by Chatham Island ribbonwood (Plagianthus chathamicus) and has mostly regenerated since the removal of stock. With increasing burrow density, soil phosphorous increases and pH and seedling density decrease. 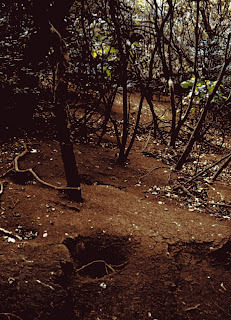 There are also more burrows found in areas with lower altitude and lower tree density. 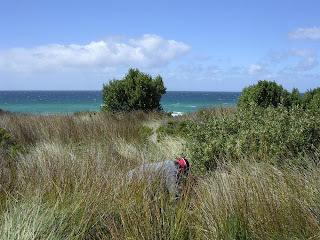 Seabird exclosure plots under the canopy showed increased seedling density compared to when seabirds were not excluded. Plots comparing regeneration between canopy and canopy gaps showed that canopy gaps are characterised by significantly higher seedling densities and fewer burrows. It is clear from these results that both treefall gaps and seabirds strongly influence the regeneration of forest on Rangatira. Forest on Rangatira clearly showing the dominance of the deciduous ribbonwood. (Photo: C. M. Roberts). 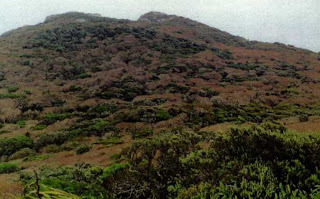 The study found that the main source of forest gaps seems to be the death of a species of tree daisy called the Chatham Island akeake (Olearia traversii). This species is slowly disappearing from the island, possibly reducing the ability of the forest to regenerate. There is a possibility that ribbonwood could progressively die and collapse, producing small canopy gaps resulting in a forest with a healthy age structure. Conversely, the young, even regrowth of ribbonwood could simultaneously succumb to the effects of extensive seabird burrowing resulting in catastrophic forest collapse. This would create an uninhabitable ecosystem similar to Grassholm Island and ‘the clears’ with catastrophic consequences for the fauna supported by the refuge that is Rangatira Island. This blog post was written by postgraduate student Ian Phillips as part of the course, Research Methods in Ecology (Ecol608). Yes I am off to Moscow. Idaho! The annual Evolution conference is being held there this year. The conference is always a great event for members of the societies that produce the journals Systematic Biology, Evolution and American Naturalist. Usually there is a great New Zealand turn-out (indeed NZ was 'rewarded' in 2006 by hosting this conference in Christchurch). Indeed, in the biogeography session I am speaking alongside Marty Kennedy (University of Otago) and Thomas Buckley (Landcare Research). And what am I speaking on? Drowning Zealandia, colonizing the Chathams: The role of overwater dispersal in the biogeography of New Zealand. The talk will look at our recent research on the flora and fauna of the Chatham Islands archipelago. In particular, I will report on the patterns that we have found by looking at about 40 endemic plant taxa and their closest relatives outside of the Chathams. The majority of endemics do not seem to differ from their mainland relatives and those that do seem relatively recent arrivals, well within the last 2 -3 million years that geology tells us is when the Chathams emerged from the ocean. Another chunk of research on dune insects finds similar results. Both data sets also imply that the South Island is a major source for Chatham lineages. The Chatham's biota ends up being a fascinating data set on over-water dispersal and colonisation. There is plenty more to tell, but that can wait for a future blog.